Ok, I know that this recipe looks enormous. And it is. But the cake that you get at the end is totally worth the effort. The delicacy of the layers and flavors combine together to make a stunning cake that will be sure to wow even the most picky holiday guest. 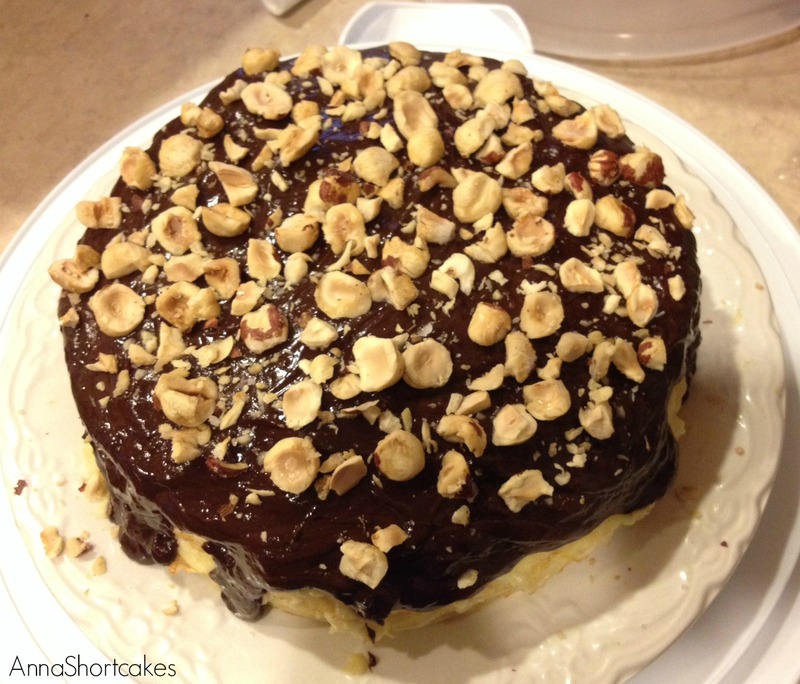 It has a great chocolate, hazelnut flavor without being overly sweet. It is rich but not overwhelming. Overall, the perfect cake. Make the crepe batter – In a small sauce pan, melt the butter over medium heat. Once it’s melted, reduce the heat to medium low. The butter will melt, then foam, then turn clear golden, and finally start to turn brown and smell nutty. Stir the butter frequently, scraping up any buts from the bottom as you do. Do not take your eyes off the pot. It browns in less than a minute then quickly burns. Remove the butter from the heat once it turns frown and nutty smelling. Transfer it to a bowl and let cool to a lukewarm temperature. In a blender, combine the milk, eggs, flour, salt, granulated sugar, and 6 tbsp of the cooled browned butter. Cover the mixture with plastic wrap and refrigerate for an hour or up to 2 days. Toast and skin hazelnuts – Preheat your oven to 350 degrees. Spread the hazelnuts out on a baking sheet, and toast them for 10 minutes, rolling them around once or twice so they toast evenly. Keep an eye on them so they don’t burn but let them get some color. Let the hazelnuts cool. Roll them between your hands to remove the skins. Do this over a baking sheet or something similar so it will catch the husks. Make the hazelnut pastry cream – In a food processor, grind 1 cup of the toasted hazelnuts (set aside the last 1/3 cup aside for decorating), confectioners’ sugar, liqueur, and salt together. It will at first make a ruckus, then will grind to a coarse chop followed by a powder. Keep running the machine until the powder begins to come together in damp-looking crumbs that combine in small clumps, and then stop. If you keep running the machine, it will turn into hazelnut butter. In a saucepan, combine the hazelnut paste, milk, and sugar over medium-high heat and bring to a simmer, stirring a bit so it doesn’t scorch. In a medium bowl, whisk together the yolks and cornstarch until smooth. Stream a small spoonful of the hot milk into the egg yolk bowl while whisking. Repeat this a few times with additional spoonfuls of the hot milk. By the time you have done five or six additions, you’ll find that the egg yolk bowl is hot; this is how you know you have added enough. Now go in reverse, slowly pouring the warm egg yolk mixture back into the hot milk in the saucepan, whisking the whole time, until the two are combined. Return the saucepan to the stove and, continuing to whisk, bring the mixture to a boil and cook for 2 minutes; the mixture should thicken upon boiling, to a loose pudding consistency. Remove from the heat, and stir in the reserved 3 tablespoons of browned butter from the crepe better recipe. Transfer it to a bowl, press a piece of plastic against the top of the custard and chill in the fridge until fully chilled. 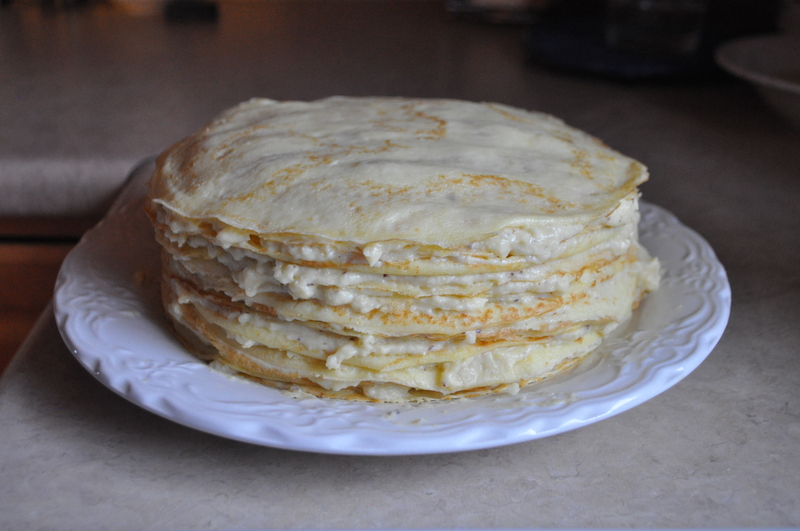 Make Crepes – Preheat a medium (9 inch) skillet or crepe pan over medium high heat. Once it’s heated, brush pan lightly with melted butter. Pour 1/4 cup batter into the skillet, swirling it until it evenly coats the bottom, and cook, undisturbed, until the bottom is golden and the top is set, about 2 minutes. Carefully flip (look for the driest-looking and darkest edge, lift it gently with a spatula so that it gets a second to cool and use your fingers to help flip it over) and allow to cook for another 5 to 10 seconds. According to Deb, the first couple will probably not turn out and there is no need to worry. They are a cook’s snack and the rest will turn out ok once you hit your crepe making stride. Continue making the crepes, transferring the finished crepes to a paper towel covered plate to cool. Continue with the remaining batter. The batter yields 19 9-inch crepes; the pastry cream volume is enough for the 16 that will probably make it. Assemble the cake – Lay the first crepe on your cake stand or plate. Spread with 1/4 cup pastry cream. Repeat with all the remaining crepes but the last one, which will act as the cake’s lid. Chill the cake in the fridge until you’re ready to coat it in chocolate. Candy hazelnuts – Spread out a piece of parchment paper on your counter, and have a set of tweezers ready. In a small, heavy saucepan, cook sugar and water together over high heat until the sugar melts and begins to turn a pale beige color, about 3 to 5 minutes. Add a pinch of salt and the hazelnuts, rolling them around to coat. The caramel will look a shade darker while you do this, a light copper color. Once it has, remove the mixture from the heat. Remove the hazelnuts one by one with the tongs, spreading them out on the parchment so they don’t touch. Cool them until they fall right off the parchment. Make the chocolate draping – Put chocolate in a heatproof bowl. Heat cream and liqueur to a simmer in a small saucepan and pour over the chocolate. Let it sit for a minute, then stir until smooth. If this wasn’t enough heat to create a very thick but still (barely) pourable smooth mixture, put a little water in the sucepan that previously heated the cream, bring it to a simmer, place the bowl of chocolate and cream over it, and stir it until it thins and smooths out to desired consistency. 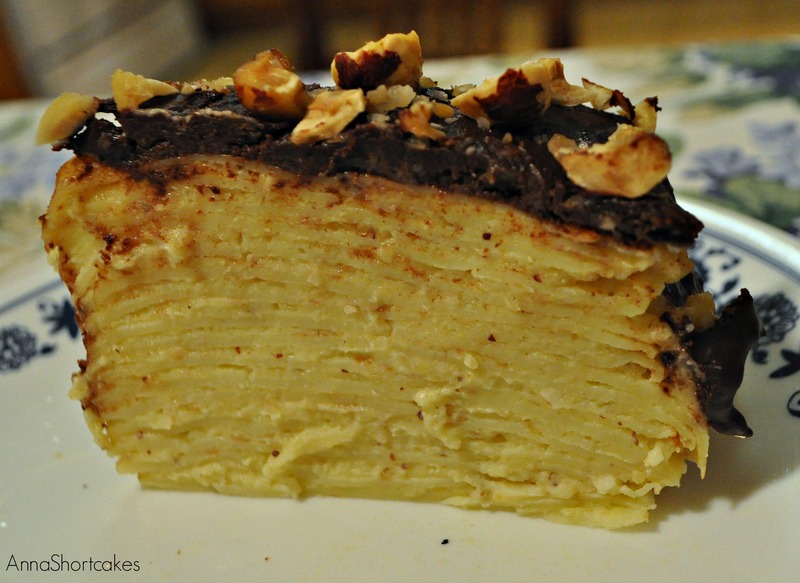 To finish – Remove the chilled crepe cake from the fridge. Pour chocolate mixture over the top, spread with your spatula to cover the top crepe, gently nudging the chocolate over the edges in a few places. Decorate the top with the candied hazelnuts. Set the cake in the fridge until needed. Makes 16 servings. Wow! It’s long but the end result looks totally worth it! It was! And I think next time I make it, I will be able to move a lot faster. With so many steps, I read and reread the recipe. I was so afraid I would mess it up and ruin all the gorgeous ingredients. I shouldn’t have worried. It wasn’t that hard and the results were amazing! Katherine has wanted to make a cake like this forever. Looks awesome. Pinned it! It is fantastic! Worth the work. The second time I make it I think I will be much faster. It also helps if you can find whole hazelnuts already out of the shells. Cracking them took a bit of time! I’m wanting to make this cake, however don’t have hazelnut liquor and don’t drink alcohol. What should I do for a substitution? Maybe some sort of hazelnut flavoring? i am not sure what is available for that sort of thing. You definitely need the extra flavor though.